Bernie and Maddie have been visiting with my 2-year-old daughter, Gia, since she was diagnosed with a type of cancer called Embryonic Botryoid Rhabdomyosarcoma in November 2011. We first met them that month while staying over for Gia’s first inpatient chemotherapy. 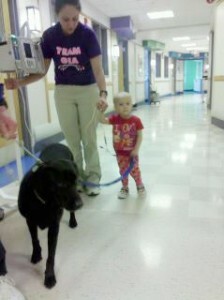 Gia loved taking Maddie for a walk around the halls of floor 5. Maddie is one of Gia’s favorite dogs. My mom, Gia’s “Mimi”, laminates the photo cards of the dogs and Gia carries them around. These dogs are some of Gia’s very special friends. Maddie has a special place with us since she was the first dog visit we had. 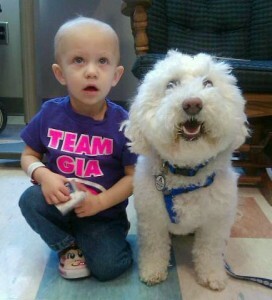 Gia will have chemotherapy through the end of November and we will be looking for our doggie friends!